Long Beach (or Pasir Panjang) is aptly named because it is a long and wide beach with a ‘V’ or birdwing-like shape. The longer northern stretch is formed by one of the wings while the other wing forms the shorter southern stretch. Tanjung Tengah is the place where both wings meet. 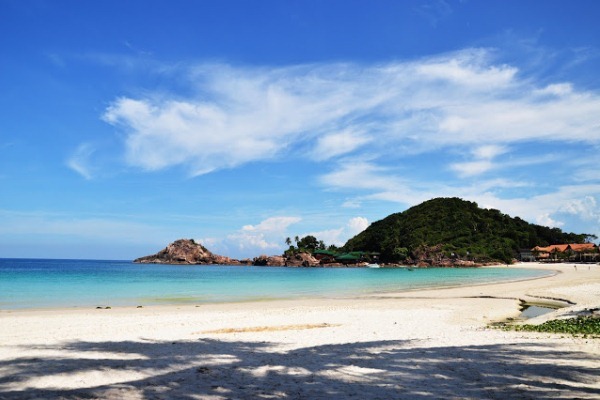 A walk from the southern tip, where Redang Reef Resort is located, to Redang Holiday Beach Villa at the northern tip would take around 15 to 20 minutes. Beach discos, karaoke lounges and open air food stalls dot the whole stretch of Pasir Panjang to cater to the large number of travellers who visit this beach. This is hardly surprising as Pasir Panjang is being shared by many resorts, making it the most active beach on Redang. 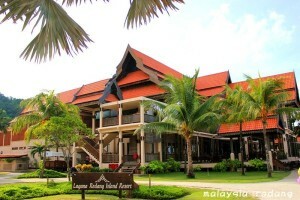 It should also be noted that the best privacy is offered by resorts located at the beach’s ends, such as Redang Reef and Redang Holiday, as well as the standard rooms of Laguna which are located in the vicinity of their dive centre in Teluk Bakau. 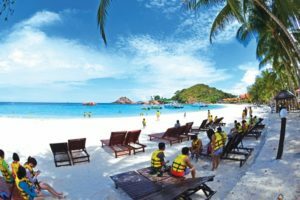 What to eat on Long Beach Redang? A variety of different food courts and local-style food stalls are available to satisfy the gastronomical needs of guests staying at Pasir Panjang. 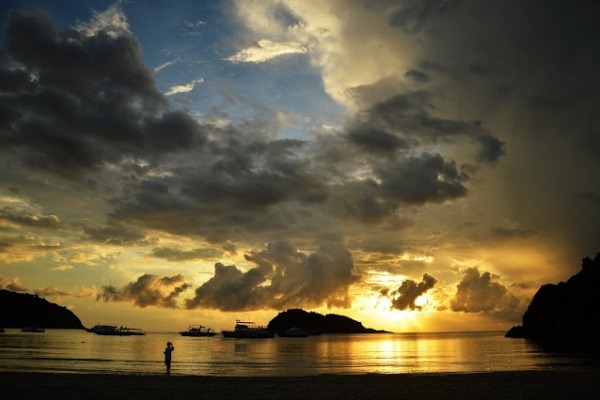 Examples include Laguna’s Food Court, Redang Beach’s Summerpoint and Kopitiam and the eateries at Redang Bay. All of these open at evening till late at night, except the Redang Bay eateries which are open most of the day. A variety of different local and international cuisine can be found at these places. One can savour delicious local food such as roti canai at the Laguna food court, Ramly burgers at the Kopitiam as well as seafood, rice and noodles at almost any eatery or restaurant. Local snacks and desserts such as fried cempedak, keropok lekor, teh-tarik and ice kacang are also available. All of these food are available at reasonable prices. At the Bay, Western fare such as fish and chips, lamb chops and steaks are priced at around RM10-RM18 while fried rice and noodles cost around RM5-RM6. On the other hand, Summerpoint offers fried rice and noodles for RM7-RM8 as well as fish-head curry for RM25. Dessert fans should not miss the ice-kacang and ice-cream at Laguna’s poolside café and the La Patissiera bakery/dessert shop at Redang Beach. Pasir Panjang is also an ideal place for travellers looking for an exciting nightlife after a whole day of water activities. 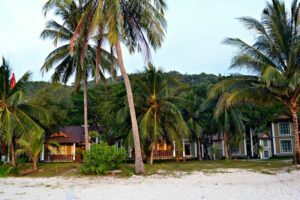 Among the exciting places for nightlife are beach discos at Redang Beach Resort and Redang Pelangi Resort or the air-conditioned indoor disco at Laguna Resort. Bold guests can flaunt their vocal acrobatics at outdoor karaoke lounges offered by many of the resorts while slightly more reserved guests can serenade their friends in indoor karaoke lounges at the disco of Laguna. Bars and cafes found in resorts offer a perfect place for non-Muslim guests to chill and relax over beer, wine and other alcoholic beverages. 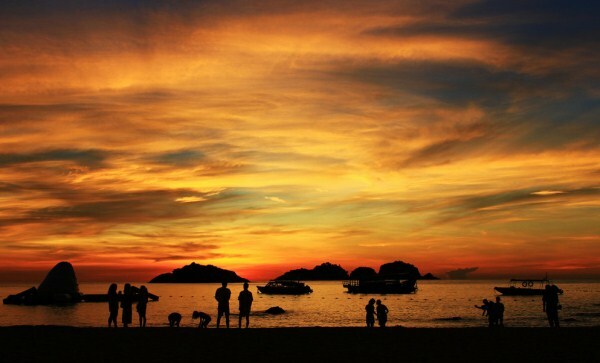 Sunrise watching is one the best activities in Redang, even though waking up from your bed at 6am is not the type of holiday you are hoping for! For visitors staying at Long Beach or Teluk Kalong have front row seats to a spectacular sunrise view, assuming that the weather is good. 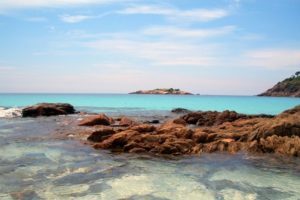 There are no resorts or beach located on the other side of Pulau Redang to catch a sunset, your best bet is to charter a boat or join a sunset cruise offered by some of the resorts.